Why would anyone want to visit Goa, the ultimate beach destination in India, during the middle of the monsoons? I’m sure a lot of people will be asking that when I tell them that Anthony and I visited there last weekend, a good two to three weeks into the rainy season. But, around these parts, going to Goa at this time of year is one the best kept secrets. There are a number of air and hotel packages, the tourists are gone, and the rains revive the foliage to a lush green. Last weekend was our first time to Goa. The small state, which lies at the tip of Maharashtra and borders Karnataka, is approximately one hour by plane from Mumbai. So, it is the obvious escape for many people who live or visit here. Nevertheless, we have opted to go to Kerala, Tamil Nadu, and up north. We figured that Goa would always be there. It was unbelievably rainy in Mumbai on the day we left, so I was a bit worried that our plane would be delayed. We took off on Air Deccan (the airline whose slogan is “Simplify,” but whose real slogan should be “Who Needs A/C, Anyway?”) about 10 minutes late, and arrived in an overcast, but surprisingly bright Goa. It may have been monsoon time, but it already felt like a beach vacation. 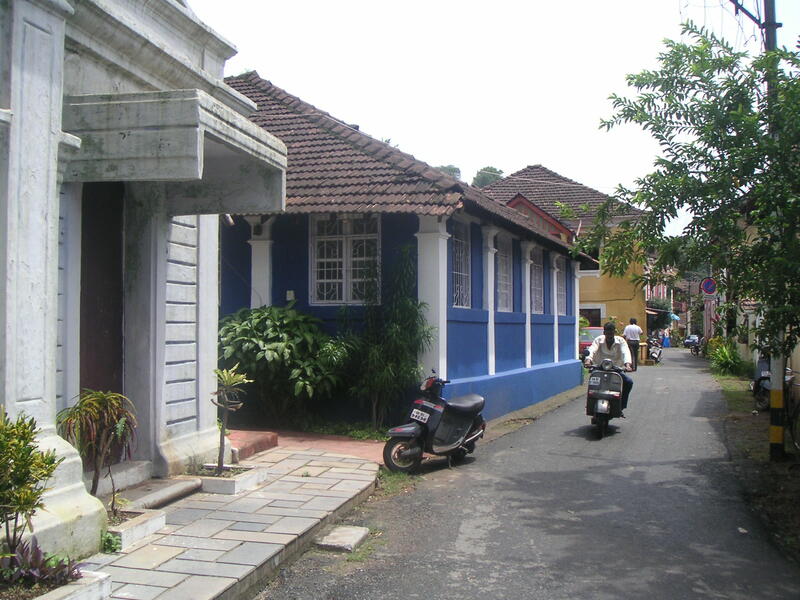 As the seas are quite turbulent during the rainy season, we had opted to stay inland at a guesthouse about five miles from the capital of Panjim (aka Panaji). 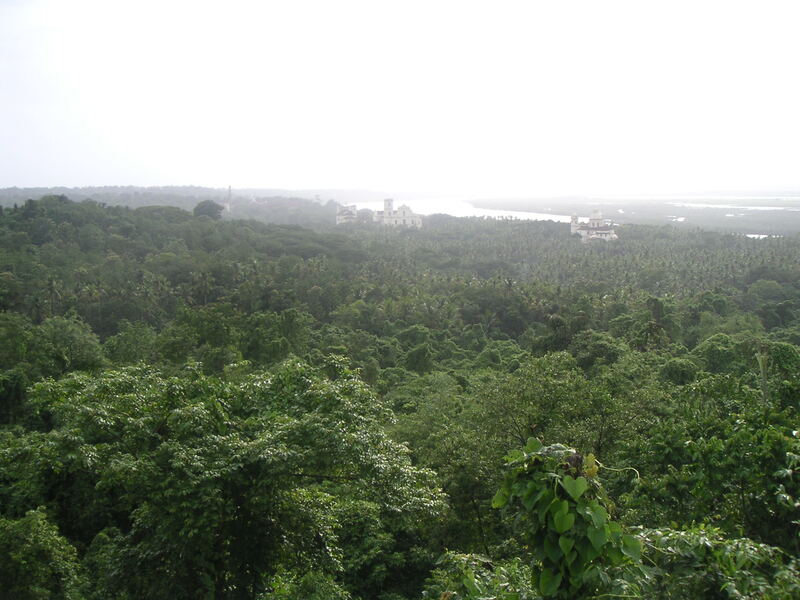 Our inn abutted the Goan backwaters, which provided the needed tranquil backdrop. From our balcony, we were able to watch fishermen in their canoes and spot birds, such as the kingfisher, who, from time to time, dropped in from a nearby bird sanctuary. Of course, seeing the kingfisher was especially satisfying while we were drinking big mugs of beer of the same name. Our perch was also perfect for watching the rains, which would start up without warning – like garden sprinklers on a timer – last for 30 seconds to five minutes, then stop. The rains were absolutely beautiful, as long as I didn’t have to get caught under them. Our first full day in Goa was devoted to sightseeing. Had I gone there during the height of beach season, I doubt I would have spent much time touring around. But knowing of Goa’s long Portuguese heritage and of its bohemian mystique, we were both curious to see the different cultural flavor that had been left behind. Saturday’s itinerary included a visit to some of the more prominent tourist sites in North Goa. By the way, as a rule of thumb, North Goa is known more for its wealth of things to do, while South Goa is quiet and much more relaxed. We started out in Panjim to do some shopping. The retail landscape was pretty similar to Bombay – handmade crafts, bric-a-brac shops, and name-brand stores such as Nike, Adidas, and Levi’s. Yawn. But we did find Anau, a shop devoted to all things Portuguese, including wine, lace, even bacalao. We quickly scooped up a couple bottles of vinho verde, as the wine selection in Bombay is very limited and pricey. As the commercial heart and capital, Panjim also has some quaint, old districts with Portuguese names, including Altinho, the hilltop where the Bishop’s House and some government ministers’ homes are located; and Fontainhas, a small community behind the immense Immaculate Conception Church where you’ll find some small chapels and tidy bungalows painted in shades of red, yellow, and violet. Goa seemed more like Brazil and less like India. After lunch, our driver took us along the coast west of Panjim. We glanced the beaches at Miramar, which were mostly deserted, save for some locals out for an afternoon walk. We also went to the overlook at Dona Paula, where the Arabian Sea, Mormugao Bay, and Mandovi River converge, forming terrific, crashing waves. It was approximately 2 o’clock and still relatively rain-free when we headed back across the Mandovi River to view the Aguada Fort, one of the strongest and oldest Portuguese forts in Goa. The Fort complex, built in 1612 and abandoned only in the late 1970s, was quite huge but not especially exciting. 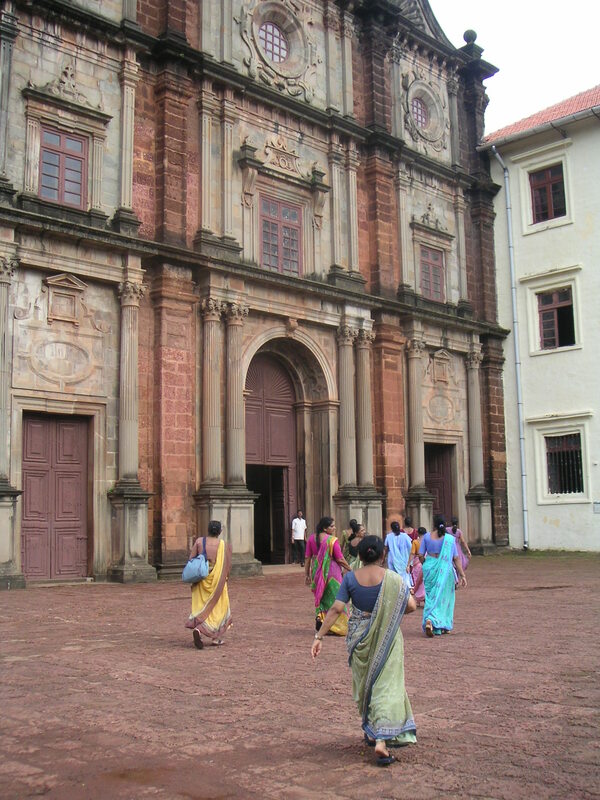 But, it was something to see during those few quiet hours when much of Goa observes a very Latin tradition – the siesta. During this time, we also paid a visit to the Reis Magos Fort, a site that, despite having been built in the late 15th century, was depressingly overgrown and boarded up. By 4pm, we were on our way to Old Goa, the area I was most interested in seeing. 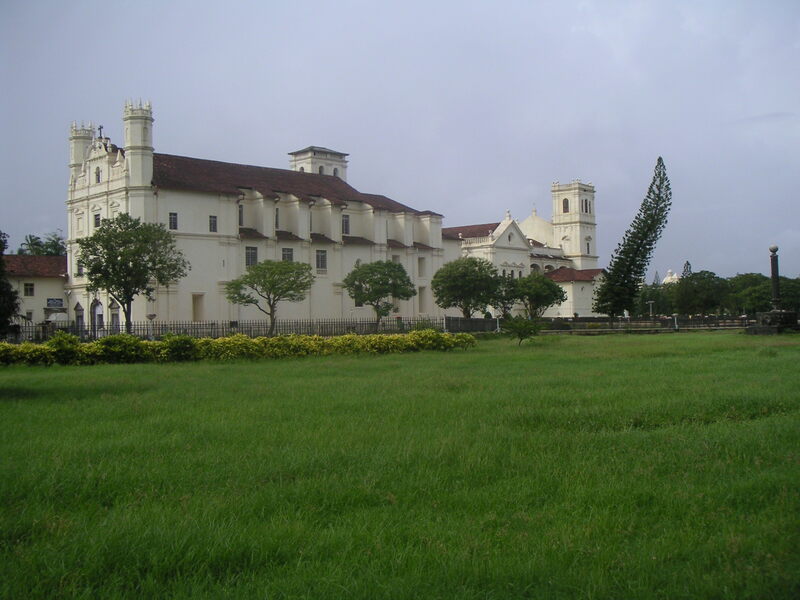 Two UN World Heritage Sites, the Se Cathedral and the Bom Jesus Basilica, are located there, the latter holding the tomb of St. Francis Xavier, patron saint of India. Unfortunately, we missed, by a matter of months, the exhibition of the body and relics of St. Francis Xavier, an event that takes place approximately once every decade. From what I gather, the church elders have been allowing the public a view of the “incorruptible body” since 1782. As I saw several “miraculously embalmed” bodies of popes in St. Peter’s the last I was there, I didn’t feel like I was missing too much by not seeing the shrivelled-up toes of St. FX. Though, if I’m feeling morbid in about 10 years from now, I’ll have a good excuse to go back to Goa. everyone is in goa it seems! sounds like you had a nice time. i went last year during monsoons, but didn’t find it quite as charming.. i think now that i’m used to the rains i might find it nicer! you should join the bombay expats group… i’m bound and determined to meet you in person someday 😉 if you do a search on yahoo groups you’ll find it! I pop up in your blog from time to time. Which inn did you stay at? please do lemme know….